This article describes the principles of microgrid design, considering the operational concepts and requirements arising from participation in active network management. The article gives a comprehensive review of microgrids, including advanced control techniques, energy storage systems, and market participation in both island and grid-connected operation. The control techniques and the principles of energy-storage systems are summarized in a flowchart. 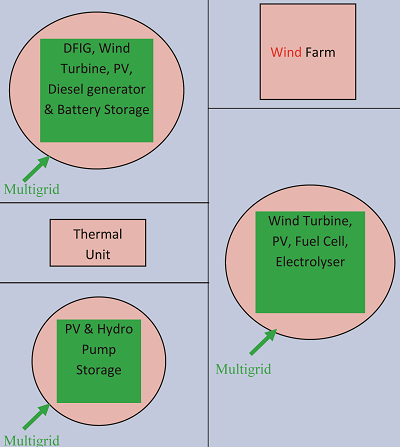 The front image illustrates the basic Micro-Grid architecture. The electrical system is assumed to be radial with three feeders, A, B and C, and a collection of loads. The micro-sources are either micro-turbines or fuel cells interfaced with the system through power electronics. The Point of Common Coupling (PCC) is on the primary side of the transformer and separates the grid and the Micro-Grid. The sources on Feeders A & B allow situations where the micro-sources can be placed away from the common feeder bus to reduce line losses, and support voltage. Multiple micro-sources on a radial feeder, however, increase the problem of power flow control and voltage support along the feeder when compared to all sources being placed at the feeder’s common bus. Placement of micro-sources away from the common feeder, however, is useful for the plug-and-play concept. Each feeder has several circuit breakers and power and voltage flow controllers. The power and voltage controller near each micro-source provides the control signals to the source, which regulates feeder power flow and bus voltage at levels prescribed by the Energy Manager. As downstream loads change, the local micro-source’s power is increased or decreased to hold the total power flow at the dispatched level. The main challenge in micro-grids with renewable energy distributed generators is similar to that of the current power systems from the point of view of stability and power quality, particularly, when the micro grids operate in islanded mode. Future distribution systems will contain microgrids and hence it is necessary to understand the steady state and transient operating conditions of such systems to evaluate their impacts on the current Grid. It is necessary to develop intelligent control algorithms for optimum operation when interconnecting distributed generators such as fuel cells, wind turbine, photovoltaic system and micro turbine to the power grid through inverters, in an islanded or grid connected mode of operation. Distributed energy resources (DER), small power generators located at users’ sites where the energy (both electric and thermal) they generate is used, have emerged as a promising option to meet growing customer needs for electric power with an emphasis on reliability and power quality. DER include generators, energy storage, and load control. Significant potential of smaller DER to meet customers’ and utilities’ needs is to organize these resources into Microgrids. Customers benefit from a Micro-Grid because it is designed and operated to meet their local needs for heat and power as well as provide uninterruptible power, enhance local reliability, reduce feeder losses, and support local voltages and correct voltage sags. The pattern of exchange of energy services between the Micro-Grid and the bulk power provider grid is determined by prevailing economic conditions. The Micro-Grid structure is an aggregation of loads and micro-sources operating as a single system providing both power and heat. The majority of the micro-sources are power-electronic based to provide the required flexibility for controlled operation of a single aggregated system. This control flexibility allows the Micro-Grid to present itself to the bulk power system as a single controlled unit, having plug-and-play simplicity for each micro-source, and meeting the customers’ local needs. Key issues that are part of the Micro-Grid structure include the interface, control and protection requirements for each micro-source as well as Micro-Grid voltage control, power flow control, load sharing during islanding, protection, stability, and over all operation. The ability of the Micro-Grid to operate connected to the grid and allow smooth transition to and from the island mode is an important function. Photovoltaic systems, medium to large, possibly building integrated, are a promising technology, while other renewables are also considered. In addition to generating technologies, Micro-grids also include storage, load control and heat recovery equipment. Renewable generation could appear in Micro-Grids, especially those interconnected through power electronic devices, such as PV systems or wind turbines. Micro-turbines, currently in the 25-100 kW range, although larger ones are under development, will ultimately be mass-produced at low cost. These are mechanically simple, single shaft devices, using high-speed (50,000-100,000 rpm), typically with airfoil bearings. Despite their mechanical simplicity, micro-turbines rely on power electronics to interface with loads. The primary fuel of Micro-turbines is natural gas, although they also burn propane or liquid fuels in some applications, which permits clean combustion, notably with low particulates. 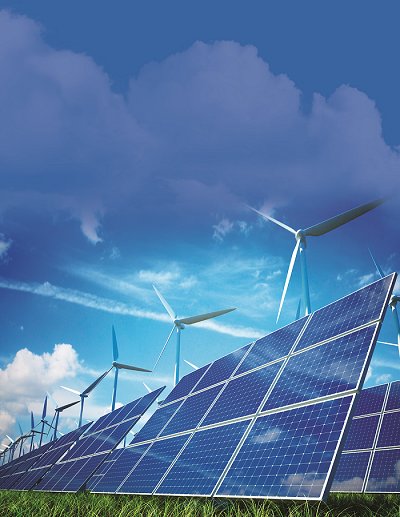 Fuel cells are also well-suited for distributed generation applications. They offer high efficiency and low emissions but are currently expensive. Phosphoric acid cells are commercially available in the 200-kW range and high temperature solid-oxide and molten-carbonate cells have been demonstrated and are particularly promising for Micro-Grid application. Fuel cell engine designs are attractive because they promise high efficiency without the significant polluting emissions associated with internal combustion engines. Environmentally, fuel cells & most renewable sources are a major improvement over conventional combustion engines. Storage technologies (batteries, ultra-capacitors) are important components of Micro-Grids. Storage on the micro-source’s DC bus provides ride-through capabilities during system changes. Twenty eight-cell ultra-capacitors can provide up to 12.5 kW power for a few seconds. Environmentally, fuel cells and most renewable sources are a major improvement over conventional combustion engines. Micro-turbines are also acceptably clean running. NOx emissions, which are a precursor to urban smog, are mainly a consequence of combustion. Some traditional combustion fuels, notably coal, contain nitrogen that is oxidized during the combustion process, but even burning fuels that contain no nitrogen emits NOx, which forms at high combustion temperatures from the nitrogen and oxygen in the air. One important potential benefit of Micro-Grids is an opportunity to utilize the waste heat from conversion of primary fuel to electricity. Because typically half to three-quarters of the primary energy consumed in power generation is ultimately released unutilized to the environment, the potential gains from using this heat productively are significant. Unlike electricity, heat, usually in the form of steam or hot water, cannot be easily or economically transported long distances, so CHP systems typically provide heat for industrial processes, on-site space heating, local district heating, or for domestic hot water or sterilization. To make CHP systems viable, a sufficiently large need for heat must exist within a sufficiently dense area so that circulation of steam, hot water, or another appropriate medium is feasible and economic. Energy storage systems should support the microgrid & increase the system’s reliability and efficiency. 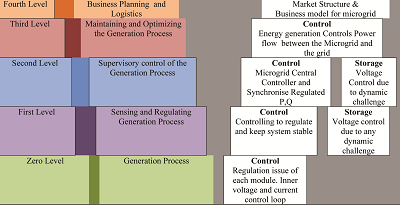 Microgrid hierarchical controls are defined at four levels (zero to three), as shown in Fig. 1. Level zero is the inner control loop for controlling the output voltage and current from the sources. The target of this control level is to manage the power of Microsources. The power electronic interface in voltage control mode manages frequency and voltage inside the microgrid while the system is connected to energy storage devices (island mode). In current control mode, where the system is often joined to the main grid (grid connection mode), the active and reactive power are managed. The inner control loop, for wind and solar power, which are the most common renewable energy sources, is created by the power converter. For instance, a Doubly-Fed Induction-Generator (DFIG) wind turbine consists of two AC/DC (rotor side) and DC/AC (grid side) converters with a DC-link that can either inject or absorb power from the grid, actively controlling the voltage. The task of the rotor side is to optimize power generation from the source, and the duty of the grid-side converter is to provide control of active and reactive power & maintain the DC link voltage. The optimization and inner controls need to have accurate reference values for the frequency and voltage amplitude, which is the duty of the primary control. Level 1, (primary control) generates the reference value for the inner control loop. The target of this control level (level one of IEC/ISO 62264 std.) is to adjust the frequency and amplitude of the voltage references that are fed to the inner current and voltage control loops. The primary control should have the fastest response (on the order of milliseconds) to any variation in the sources or the demand. The fastest response increases the power system stability. The primary control can also be used to balance energy between the DG units and the storage elements (batteries). The contribution of active power can be adjusted in line with the availability of energy from each DG unit, depending on the batteries’ state of charge. The DG power converter control techniques in AC microgrids are classified into grid-following and grid-forming methods. Grid-forming converters are voltage-control based with an equivalent circuit of a voltage source in series with a low impedance. Grid-forming converters create a reference value for voltage and frequency by using a proper control loop. On the other hand, grid-following power converters are designed as control-based and can be represented by a current source in parallel with a high impedance. In addition, power delivery to the main network in grid-connection mode is the responsibility of the grid-following power converter. Power converters in the island mode must be of the grid-forming model in order to determine the voltage reference value. Grid-following converter cannot control microgrid in island mode. 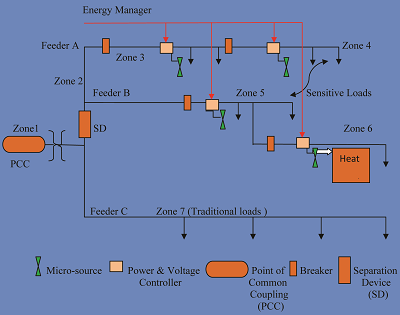 Level 2, (secondary control) monitors and supervises the system with different methods. The secondary control section (second level of IEC/ISO 62264 std.) works to compensate for voltage and frequency errors and to regulate the value in the operational limits of the microgrid. It ensures that the frequency and voltage deviations are regulated towards zero following each load or generation change in the microgrid. It serves power systems by correcting the grid-frequency deviations within allowable limits, for example by ± 0.1 Hz or ± 0.2 Hz. The response speed of the secondary control is slower than the first control level because of limitations due to availability of primary sources and battery capacity. Level 3, (tertiary control) manages the power flow and interface between the microgrid and the main network. The system should function at predefined operating points, or within satisfactory operating limits. Active and reactive power must be transferred by optimal means. System stability should be maintained. Processes of disconnection and reconnection should run seamlessly. Production of local micro-sources should be optimized for best market participation and power exchanges with the utility. Loads must be classified according to sensitivity, from highest to lowest. Eg. medical equipment is the highest priority consumer load. Energy storage systems should support the microgrid & increase the system’s reliability and efficiency. Storage of energy can be achieved by converting electrical energy into another form, such as chemical or mechanical energy, Fig. 2. A microgrid can participate in the energy market, as in ancillary service markets. The oligopolistic (Oligopoly means the market condition that exists when there are few sellers, as a result of which they can greatly influence price and other market factors) method, based on a multi-agent system, is the best market structure for microgrids. Multigrid agents are divided into production, consumption, power system, & microgrid central controller (MGCC) agents. MGCC must also coordinate the priority of loads. MGCC, along with the consumption agent, participate directly in the marketing operation. Moreover, the power system agent is one of the most effective components for determining the buying and selling price for electricity, but does not itself participate in marketing operations. Microgrids buy and sell the shortage or surplus of power to or from a main grid through an aggregator. Therefore, the microgrid and the main grid have different perspectives to the aggregator. For instance, during the selling of power by the microgrid to the main grid, the aggregator is the seller from the point of view of the main grid, and is the buyer from the perspective of the microgrid, Fig. 3. Fully Distributed Controlled Virtual Power Plant (FDCVPP). VPPs must always be connected to the main grid and do not have the capacity to work in island mode. Hence, all their control levels are always enabled—unlike in multigrids, where the third control level is sometimes disabled. 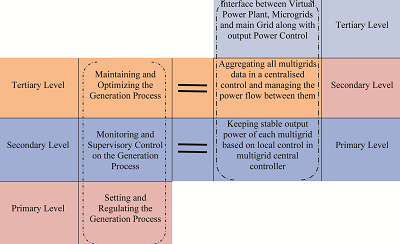 However, there are some different responsibilities in controlling multigrids based on the standard level, compared with VPPs. These differences are shown in Fig. 5. The article discusses the microgrid structure, renewable technologies, and uses of CHP, and virtual power plants. In future, all new production units above certain sizes will have to be equipped with both active-power and reactive-power control. This will make it easier to maintain stability of the grid which is an important aim of the grid codes. However, from a market viewpoint, compulsory requirements of both active and reactive power controls are not the best solution. Normally, the price and availability of a product is determined by investment costs and operational costs. But if it becomes compulsory for production units to invest, then it will only be the operational costs that matter for the market bids. For eg, the use of demand for frequency and voltage regulation becomes less attractive because of the compulsory investment. An owner company’s ability to participate in an ancillary market in future is determined or even prevwented by an investment decision it takes now. A profit prospect in an uncertain future market will be discarded in a decision one takes now. Also, a future choice to participate in the market will cover operational and retrofit costs, which are higher than installation costs.